Elaine packages bulk food for the Bienvenidos food bank in Denver. The Valmont Women’s Association meets the second Tuesday of each month (summer excepted) for lunch, Bible study and projects to help others. 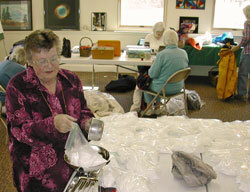 Projects this year have included making cloth bags we filled with hygiene articles for migrant workers in Alamosa, dividing sacks of flour and sugar into smaller bags for the Bienvenidos food bank in Denver and making quilts and baby articles for Warm Hearts Warm Babies in Brighton. 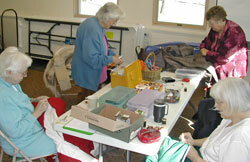 The Women’s Association repaired coats for donation.